January is a strange time for travelers. 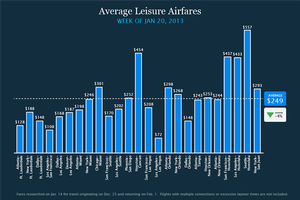 Leisure travelers are enduring winter in much of the U.S. and paying off their holiday debt. Conversely, business travelers are criss-crossing the country as conference season heats up. The polar opposite conditions is resulting in a nice lull in pricing for all travelers this week. Hotels are down overall, though the aforementioned conventions and conferences are making rooms a commodity in the big cities. 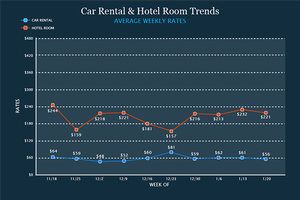 Car rental prices are down, as are leisure and business airfares this week. That's the overview for the Jan. 20-26 travel picture in the Murphy Travel Index. This week, we give you our second look at the cruise pricing picture, looking ahead to prices for February. 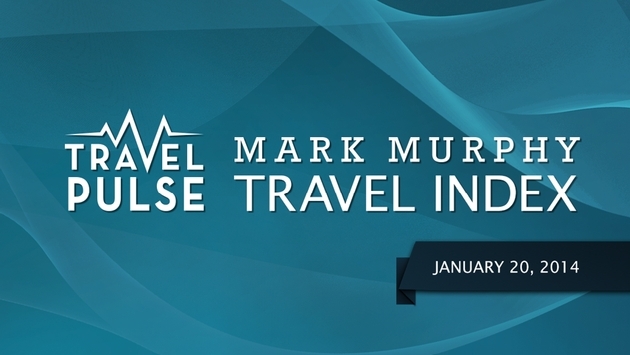 To be clear: Our numbers are based on research done last week looking for fares and rates for the Jan. 20-23 week, except for leisure airfare, which was researched looking ahead at flights for the week of Jan. 25-Feb. 1. 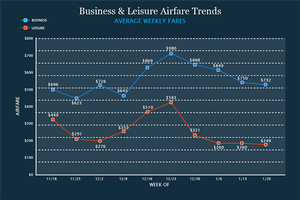 - The downward trend for ticket prices continues this week, with fares registering a 4 percent drop from last week. - Spirit is the low-price leader this week, with best prices on six of our 25 routes. U.S. Airways is next with four of the best prices on routes. 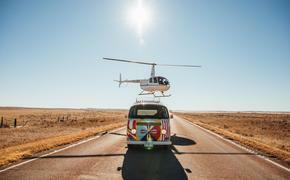 - This is in stark contrast to December, when fares rose steadily in anticipation of the holidays. Now that everyone is back to work, fares drop accordingly. - For those planning a getaway, fares are below $200 on several routes, including Atlanta to Ft. Lauderdale, San Francisco to Los Angeles, Atlanta to Miami, San Francisco to Seattle and Los Angeles to Las Vegas. - San Francisco passengers looking to kill some time at the airport on Jan. 25 can get a sneak peak at United’s new Terminal 3E boarding area, scheduled to officially open on Jan. 28. The $138 million renovation of the 10-gate area will be on display from 12 to 5 p.m. to those who register in advance at eventbrite.com. - Ticket prices are down 2 percent from last week, as weekday seats on low fare carriers open up and drive prices down on certain routes (Boston to Washington, D.C., and Boston to Chicago). - U.S. Airways and Spirit are tied for best prices this week, with bests on four of our 25 routes each. - For the first time since we started tracking prices, fares remain unchanged on seven of the Index routes this week. - Prices dropped across the board on all international flights, with the exception of San Francisco to Hong Kong. - The prices continue to drop for leisure travelers, as this is the fourth straight week prices have either held steady or dropped. - Prices are at $249 on average this week, down $11 from last week. The average this week set a new low for average price in our Index. 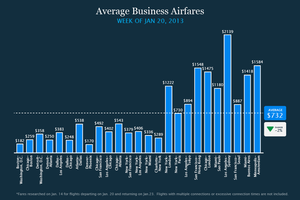 - Business fares are down for the fourth straight week, dropping $18 overall on average from last week and now just $109higher than our lowest weekly average ($623 week of Nov. 25, 2013). - Get in on the frequent flier frenzy: Anticipating the day when AAdvantage subsumes the US Airways Dividend Miles program, American and US Airways frequent fliers may now earn a 50% mileage bonus when they choose to earn miles on flights operated by the other airline. The offer is good on flights through March 2, and members must register in advance in order to be eligible for the bonus. JetBlue is offering double points for all flights purchased and flown between now and March 3. - “Economy Comfort” passengers on Delta’s transcontinental flights between New York (JFK) and Los Angeles, San Francisco or Seattle will now receive complimentary sandwiches and snacks from Luvo. The airline already offers Luvo snacks on its West Coast shuttle flights. The cost of the larger “Economy Comfort” seat can range anywhere from $10 to $200 depending on the destination. - Room rates are down 5 percent from last week, but remain high in cities that are packed with meetings, conferences and conventions. - Hotel rooms are scarce, expensive and full of animal lovers in Orlando (up 53 percent from last week) as the city hosts gatherings for veterinarians, “process excellence” professionals, and PGA merchandisers. - Las Vegas is hosting the “World of Concrete” exhibit, while San Diego welcomes conference attendees in the areas of biodiesel fuels, healthcare IT and utility supply chain. 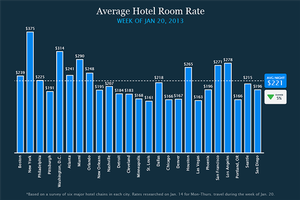 Hotels are crowded and expensive next week in Washington, D.C. (up 11 percent), Philadelphia (up 11 percent), and New York (up 7 percent), but Detroit empties out after the International Auto Show, and prices are down in Minneapolis (down 20 percent), Denver (down 23 percent) and San Francisco (down 17 percent). - Members of Starwood’s Preferred Guest program can take “a spin a day” on the company web site to take a chance on winning a prize. The promotion is to celebrate the hotel chain’s new partnership with Caesar’s Entertainment Hotel and Casino in Las Vegas and runs through Feb. 7. - Although the overall average is down 8 percent from last week, car rental customers in certain cities will be paying a premium for their mid-sized cars. - Rates are high and availability is tight in Boston (average daily rate of $51), Washington, D.C. ($74), New Orleans ($86), Dallas ($92) and Detroit ($81). - Across the board, there is a large discrepancy in prices between the lesser known brands, and the “big two,” Hertz and Avis. Business travelers who opt for the name brands can expect to pay double the price for a rental. - Hotel prices are down $11 since last week and are returning to pre-holiday rates ($218 average the week of Dec. 2). 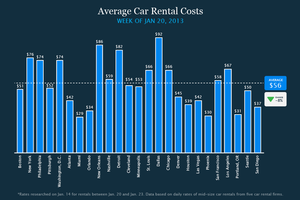 - Car rentals dipped only again, dropping $5 since last week. This week's drop is tied for the largest one-week drop since we began tracking in November (Nov. 18-25). We're presenting the information a bit different this month, as our data outgrew the normal graphs. - Higher prices and less of a selection are the hallmarks of this month’s cruise Index. 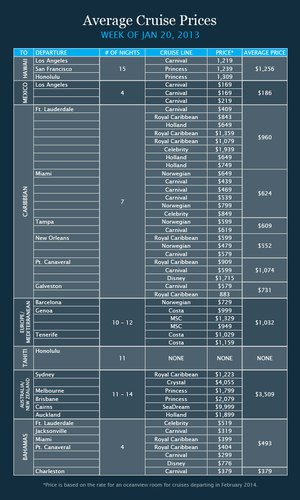 - Prices for cruises to the Bahamas and the Caribbean are between $100 and $200 higher than last month (a 14 percent hike overall month-over-month), and the price for a luxury cruise between Australia and New Zealand has more than doubled since January. - There are bargains, though, for those who book a cruise within the next few weeks: Royal Caribbean is offering up to a $400 OBC (on board credit), a reduced deposit and reduced pricing for cruises booked before Feb. 28, and Oceania is offering discount air fare and two for one deals on selected cruises booked before March 31. - Agents report that European river cruises are nearly sold out for 2014, with some exceptions being in the warmer months of June and July.